Since time immemorial 'Manas' has been the subject of curiosity for scholars, scientists and philosophers. The reason behind this curiosity is its importance in the development of mankind. Human being is superior to other creatures in the series of development. This supremacy of man remains in his quality to work after thinking, which is the function of 'Manas'. No other animal is capable to think logically. This is the only reason which leads the mankind to the crest of development in every aspect. To highlight the concept of Manas in Yoga Darshana, information extracted from Yoga literatures and Ayurvedic Samhitas. In Indian culture mind has been described from various angles. Vedic, Philosophical and Ayurvedic literatures have a vast and exclusive description of Manas. Philosophers either Astika or Nastika have described Manas Siddhanta vividly. Though many kinds of difference of opinions are there, Yoga Darshana accept the importance of mind in the process of perception and even for the birth of any individual. 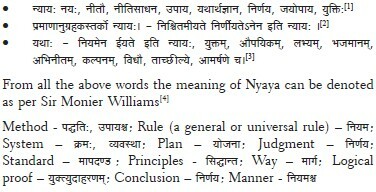 The Nyayas - Maxims are of two types: (1) Loukika Nyaya and (2) Shastriya Nyaya. Loukika Nyayas are the one which are used by the common public in day today life whereas Shastriya Nyayas are the one which are used by the authors of the treatise to explore their concepts. Most commonly by using the meaning and gist of Loukika Nyaya, the Shastriya Nyayas were put forth by the Granthakaras. Moreover, notion of Nyaya depends upon the situation, place, and topic of explanation mainly. To explain the meaning of the topic, these Nyayas helped since Vaidika Kala. They teach hidden meaning correctly. As like Vedas, these Nyayas are also a part of other Shastras and so as in Ayurveda Shastra too. While explaining the Nidana, Chikitsa, etc., these Nyayas were utilized by the Acharyas of Ayurveda. To discern these Nyayas in their entirety at one place with examples is necessary for easy understanding of the Shastra. Here is an attempt to explore such Nyayas mentioned in Ayurveda for the benefit of easy understanding of the subject. To maintain health and to cure diseases through Rasayana (rejuvenation) therapy along with main treatment is the unique approach of Ayurveda. The basic constituent unit of a living being is always a functional cell. Question arises from where it is generated? How it attains its final specific differentiation form? As age progresses, various changes occur at every cell level and cell undergoes to adaptation accordingly. Microenvironment for cell nourishment diminishes with age or as disease condition persists. In this context, Acharyas had contributed and documented various facts and theories through their insight wisdom. Hidden secretes in the basic principles of any medical system are needed to be explained in terms of contemporary knowledge. Contemporary research areas should be opened to include various explanations of different fields of ancient thoughts to support these new doctrines, if any. This review may be helpful to open the door of future research area in the field of reverse scientific approach of Ayurveda in the context of Dhatu Siddhanta (theory of tissues formation and differentiation) and theory of stem cell. The nanoparticles are a miracle invention of the century that has opened novel avenues of applications in various fields. The safety aspect of exposure to nanoparticles for humans, plants, animals, soil micro-flora, and ecosystem at large has been questioned. The safety concern can be addressed by laboratory studies to assess the actual risk and recommend exposure limits and related regulation. There is also a suggestion for considering the nanoparticle form of conventional compounds as a new chemical and subject it to safety assessment in line with the chemical regulatory agencies. In the light of the current scenario of popularity and safety concerns regarding nanoparticles, the use of ancient metal based forms like, Bhasma is revisited in the present article. The current approach of green synthesis of nanoparticles is compared with the Ayurveda Rasayana Shastra guidelines of Bhasma preparation and modern preparation of engineered nanoparticles. Since the benefits of nanotechnology are undeniable, and safety concerns are also not ungrounded, there is a pressing need to revisit the ways nanoparticles are manufactured, and to carry out safety assessment by the techniques specially adapted for this novel compound. 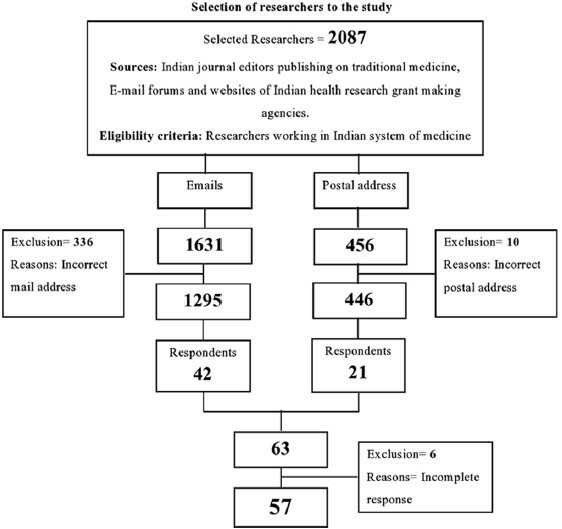 Context: Research methodology in traditional Indian system of medicine. Aim: To determine the knowledge level of investigators conducting clinical trials in traditional medicines (TMs) including Ayurveda. Materials and Methods: This was a questionnaire survey conducted for selected researchers trained in any specialty and working in TM. 2087 researchers were selected based on selection criteria. 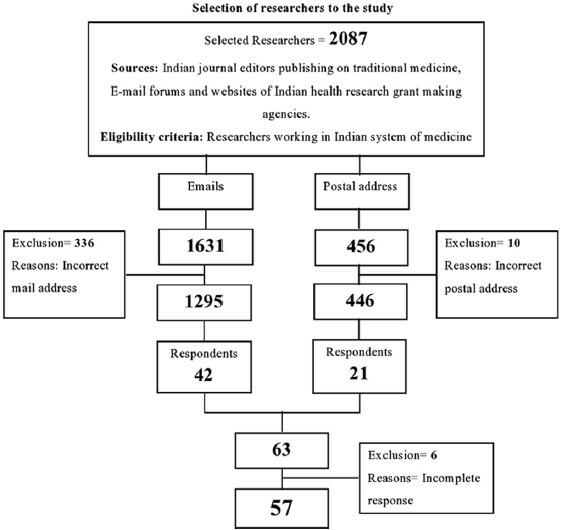 A validated and pretested questionnaire containing the questions regarding regulatory issues, literature search, evidence-based medicine, clinical trial design, patient selection, and study reporting were sent either through E-mail or post. The answered questionnaires were analyzed. The parameters were analyzed based on median and interquartile range (IQR). Results: Forty two responses were received through E-mail and 21 researchers responded through post. Out of 63, six researchers sent incomplete responses. Among the remaining 57 respondents; 34 (59.6%) investigators had postdoctoral degree, 43 investigators (75.4%) did not receive any structured training on research methodology, 23 (40.4%) had two decades of research experience. Thirty three (74%) of investigators who received government funding didn't have any training on research methodology. 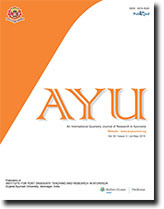 Ayurveda experts group had better knowledge compared to pharmaceutical sciences and basic science group although they had a dilemma about conducting clinical evaluation of TM within the specific framework of rigorous clinical pharmacological principles without ignoring the Ayurvedic concepts such as Dosha, Prakruti etc., Investigators below 30 years possessed higher knowledge of research methodology when analyzed based on the age. The respondents working in research organizations, government organizations, and academic institutions had lower knowledge compared to those who were in private organizations/practice. Conclusions: It is recommend that investigators, peer reviewers, and fund managers involved in traditional medicine research need training especially in research methodology. Background: The incidence of anemia rises with age. The consequences of anemia are many and serious, affecting not only individual's health, but also the development of societies and countries. Pandu Roga can be effectively compared with anemia on the ground of its similar signs and symptoms. Aim: To evaluate the Panduhara and Rasayana effect of Punarnava Mandura in the management of Pandu Roga in old age (geriatric anemia). Materials and Methods: The study was conducted in 50 clinically diagnosed patients of geriatric anemia. Patients were treated with Punarnava Mandura 2 tablets (250 mg each) twice in a day after lunch and dinner with Takra (butter milk) for 90 days. Among 50 registered patients, 40 patients had completed the treatment and 10 patients discontinued the treatment. Results were analyzed using Wilcoxon signed-rank test for subjective parameters and for assessment of objective parameters paired t-test was adopted. Results: At the end of study, drug has shown beneficial effect in patients of anemia by providing highly significant result in chief complaints, associated symptoms, Kshaya of Dhatu and Agni Bala, Deha Bala and Sattwa Bala. It has also improved quality-of-life (QOL) of the patients. Moderate and mild improvement was observed in 30 and 70% of the patients respectively. Conclusion: Punarnava Mandura may work as Rasayana in geriatric anemia by providing highly significant results on clinical features of Pandu Roga, Dehabala, Agni Bala and Sattwa Bala and by improving QOL. of patients of geriatric anemia. Background: Increasing morbidity and mortality of Asthma placed it among the most dreaded diseases. Prediction says that asthma along with chronic obstructive pulmonary disease become third leading cause of death by the year 2020. Despite the availability of a wide range of antiasthmatic drugs, incidence of asthma is increasing alarmingly because the relief offered by these drugs is mainly symptomatic and short-lived. Moreover, their side effects are also quite distressing. Hence, a continuous search is needed to identify effective and safe remedies to treat bronchial asthma. Aims: The present clinical study was conducted to evaluate the efficacy of Shirishadi Polyherbal compound (given through nebulizer in Aerosol form) in the management of acute and chronic uncomplicated Bronchial Asthma and to propose a novel and safer Ayurvedic treatment modality. Methods and Materials : It is a randomized, open, control clinical trial in which the effect of the drug was compared with contemporary treatment and placebo medication (normal saline) in 60 adults with mild to moderate asthma. Results: There was a (t>0.001) found in pulmonary function tests (including FEV1, FVC and PEFR) in the group treated with polyherbal drug. Improvement remain constant in consecutive follow-ups signifies that there is no reverse broncho-constriction after discontinuation of the drug. Conclusion : This study signifies that polyherbal drug -Shirishadi compound may prove beneficial future alternative remedy for asthma, and its effect is similar to that of modern contemporary drug when given through nasal route. Background: Lifetime incidence of low back pain is 50-70% and incidence of clinically significant sciatica due to lumbar disc prolapse occurs in 4-6% of the population. Low back pain and sciatica is major cause of morbidity throughout the world. There is only conservative treatment giving short-term relief in pain or surgical intervention with side-effect. There is need to find out quick relief from pain in today's era as it affects physical as well as mental and social life of patients. In Ayurveda, various modalities are given but Agnikarma and Siravedha are supposed to give instant relief from pain. Aims: To compare the efficacy of Agnikarma and Siravedha in the management of Griidhrasi. Materials and Methods: It's an open randomized parallel group trial. A total of 30 patients, divided randomly in two groups, were treated by Agnikarma in 19 patients and Siravedha in 11 patients. Agnikarama was done at lumbosacral spine and Achilles tendon region by Panchadhatu Shalaka. Siravedha was done from four Angulas below Janu Sandhi (Knee joint). Placebo starch capsules were given to all patients. Paired t-test applied for efficacy within the group and Chi-square test to compare the efficacy of two groups. Results: Individually both groups had given relief in cardinal symptoms of Gridhrasi. 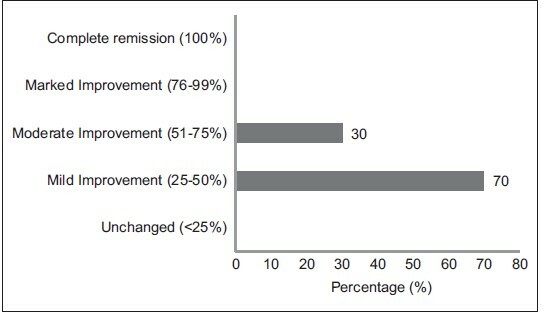 68.42% patients showed marked improvement and 21.05% had complete relief after Agnikarma. In Siravedha, 72.73% patients had moderate improvement whereas 27.27% patient had marked improvement. Conclusion: Agnikarma gives better effect than Siravedha in management of Gridhrasi. 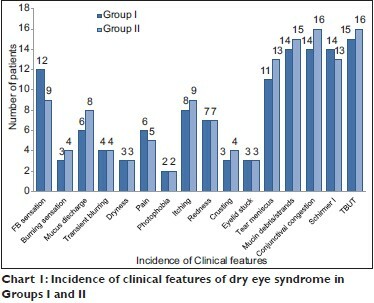 Background: Dry eye syndrome (DES) is a common ophthalmic problem predominantly affecting middle-aged and elderly people. It is a disease of deficient or deranged tears and ocular surface disorder producing symptoms of discomfort, visual disturbance, and tears film instability. Shushkakshipaka, an etymologically and clinically similar entity to DES, is defined in Ayurveda as the disease affecting all parts of the eye characterized by Paka (inflammation) due to Shuskatva (dryness) caused by altered coherence of Ashru (tears) with ocular surface or due to lack of Ashru. Aim: To compare the effect of Keshanjana and Netra Parisheka in Shushkakshipaka with artificial tear drops (carboxy methyl cellulose [CMC]). Materials and Methods: To search a safe, potent and cost-effective Ayurvedic treatment for DES, a randomized comparative clinical trial was conducted on 32 patients. Patients were divided in two groups 15 in group I and 17 in group II. Group I treated with artificial tear drop four times a day for topical use and group II treated with combination therapy of Keshanjana applied topically once a day and Netra Prisheka was done thrice a day. Results: The effect of Ayurvedic management was found to be equivalent to the standard therapy, although the trial drugs provided more relief in foreign body sensation, burning sensation, dryness, pain, photophobia, itching, crusting, stuck eyelids, tear meniscus, conjunctival congestion, Schirmer I test, and tear film break-up time (TUBT). The standard therapy provided more relief than trial drugs in mucous discharges, transiently blurred vision, redness, and the presence of mucin debris in tear film. Conclusion: Keshanjana and Netra Parisheka can be used as a potent, safe and cost-effective treatment to ameliorate the symptoms of DES. Background: Anemia in pregnancy is multi-factorial. Iron deficiency anemia (IDA) is the most common one. Major cause is increased demand of iron during pregnancy. In Ayurveda, under Pandu-Roga the features of anemia are described. It is characterized by Vaivarnyata or Varnanasha (change/destruction in normal color of the body), a disorder of Pitta vitiation. Ayurvedic management is an effective way of curing anemia in general by a large number of Lauha preparations of which Dhatrilauha has been used widely for centuries. Aim : To evaluate the effect of Dhatrilauha in the management of IDA based on the scientific parameters among pregnant patients. 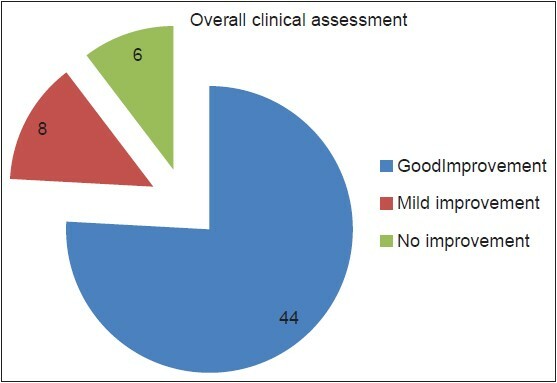 Materials and Methods: A total of 58 cases were selected by simple randomized sampling method as per inclusion criteria of pregnant women between 4 th and 7 th months of pregnancy with a clinical diagnosis and laboratory confirmation of IDA. Dhatrilauha 500 mg in two divided doses after food with normal potable water were given for 45 days with three follow-ups, each of 15 days intervals. Final assessment was done after completion of 45 days and results were statistically analyzed by using Cochran's Q-test and Student's t-test. Results: . Dhatrilauha showed statistically significant (P < 0.01) improvement in the majority of sign-symptoms and objective parameters such as weakness, fatigue, palpitation, effort intolerance, breathlessness, heartburn, pallor, constipation, hemoglobin, red blood cells (RBC), hematocrit, mean corpuscular volume, mean corpuscular hemoglobin concentration, RBC distribution width, mean platelet volume, serum iron, and total iron binding capacity. Conclusion: Dhatrilauha possesses many fold effectiveness in anemia (IDA), which was evidenced with the significant results obtained in the majority of parameters in this study. Background: Nausea and vomiting are the most common complicated issues in pregnancy period, but they have not been paid much attention. Herb based formulations can be effectively used for the treatment nausea and vomiting observed during pregnancy. Aim: To investigate the effect of ginger in nausea and vomiting during pregnancy in comparison with vitamin B6 and placebo. Materials and Methods: This is a randomized and double-blind clinical trial. The women who had nausea and vomiting and did not take any medications were included in this study. 120 women were selected by simple random sampling method, and divided into three groups and were given vitamin B6, placebo, and ginger, respectively. 97 women completed the treatment. They were given treatment for 4 days and were followed after a week. The instrument used in this study was a questionnaire, including demographic characteristic and determining severity nausea and vomiting based on the analog visual scale. Data were analyzed with SPSS software and t-test and Kruskal-Wallis test. Results: There was significant difference between groups in severity of nausea and frequency of vomiting (P < 0.001). Conclusion: Ginger was effective in treating nausea and vomiting in pregnancy, but its use needs further studies to determine the proper dosage and the confirmation about the safety of this drug for a pregnant mother and her fetus. Background: Cerebral palsy is a static encephalopathy that may be defined as a non-progressive disorder of posture and movement often associated with epilepsy and abnormalities in speech, vision and intellect resulting from a defect or lesion of the developing brain. There are 25 lakhs cerebral palsy affected children in India. Aim: To assess the efficacy of Rajayapana Basti (RB) and Baladi Yoga in motor disabilities of cerebral palsy in children. Materials and Methods: Total 98 children satisfying diagnostic criteria and between the age group of 2-10 years were included and randomly divided into two groups. In RB with Baladi group (n = 40) patients were treated with Mustadi Rajayapana Basti for 8 days, followed by oral administration of Baladi Yoga with honey and ghee for 60 days. Before administering Basti, patients were subjected to Sarvanga Abhyanga and Sastikashali Pinda Sveda. In the control group (n = 40), patients were given tablets of Godhuma Choorna for 60 days. Before administering the placebo tablet, the patients of the control group were given Sarvanga Abhyanga and Sastikashali Pinda Sveda for 8 days. The patients of the control group were given Basti with lukewarm water for 8 days. Results: RB group has shown improvements in understanding ability (13.43%), speech (10%) and performance skill (11.11%), in fine motor functions such as putting small object in to a container (14.3%), throws the ball in all direction (21.8%), use of thumb and index finger (10.93%), retaining 2 inch cube in fist (19.04%), folds paper and inserts into envelope (10.30%), in gross motor functions such as in crawling (26.7%), sitting (31.7%), standing (13.75%), walking (9.5%) and claps hands (13.9%) respectively. Conclusion: Mustadi RB along with Baladi Yoga provided a significant improvement in all the parameters and has promising result in managing motor disabilities of cerebral palsy in children . Acharya Sushruta has emphasized the method and importance of dissection to study anatomy practically. Perfect knowledge of anatomy is vital for practicing surgeons and hence training of dissecting the dead body was considered as mandatory for surgeons. Though dissection techniques may give the perception of the structure of organs, the pervading and subtle consciousness in the body can be experienced with the eyes of knowledge and penance only . Though standard anatomy is defined based on statistical inferences on comparing large number of subjects, individual variations and exceptional structural specialties tend to occur quite frequently. Proper recording and publication of such instances would strengthen the knowledge base of the science. During the routine cadaveric dissection in the anatomy lab, multiple aneurisms (Siraja Granthi) in the abdominal aorta and femoral artery of 55-year-old male cadaver were observed. Such pathological variations are uncommon but clinically significant. Rupture of aneurysms or clot formation inside the lumen can produce serious complications in living condition. Enhancing size of the aneurysm producing pressure effect on the nearby structures can be the other reason for the surgical intervention. A good number of these can remain asymptomatic for a considerable period. As the clinical consequences are wide varying, the disease is of interest to physicians, as well as surgeons. Background: Woodfordia fruticosa (L.) Kurz., known as Dhataki, is an important medicinal plant used in Ayurveda. Recent studies on leaf showed that it contains important chemical constituents responsible for biological activities. The ethnic folk from India and Nepal are using the leaf to treat ulcers, rheumatism, fever, hemoptysis and as a disinfectant. It is also reported to be used in perfume, leather and textile industries. Aim: To investigate preliminary pharmacognostical and phytochemical parameters of leaf to standardize the drug. Materials and Methods: Identification of plant was done as per the standard guidelines given in the floras. Macro and microscopic evaluation performed as per the routine laboratory procedures. Phytochemical, physico-chemical, florescence analysis, behavior of powdered drug have been conducted as per the WHO guidelines. Results: Unique arrangement of the vascular bundle in mid rib region is observed. Aqueous and alcoholic extracts showed the presence of alkaloids, phenols, tannins, and flavonoids. 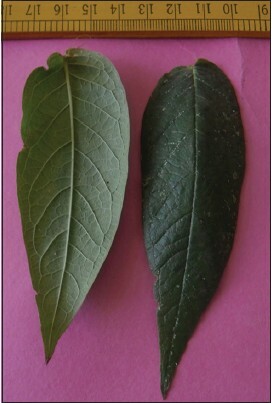 Conclusion: The findings of this study will be helpful in the identification of Dhataki leaf. Background: Standardization of Ayurvedic medicine is the need of hour to obtain desired quality of final product. Shodhana literally means purification, is the initial step to make drugs like metals, minerals and poisonous herbs suitable for further procedure. Shodhana of metals/minerals help to expose maximum surface area of drug for chemical reactions and also in impregnation of organic materials and their properties in the drug. Thermo-gravimetric analysis (TGA) facilitates in identifying the presence of organic matter and change in the melting point of metal whereas Fourier transform infra-red spectroscopy (FTIR) assists in identifying the presence of various functional groups. Aim: To standardize the process of Naga Shodhana and to study the change in chemical nature of Shodhita Naga in each media through TGA and FTIR. Material and Methods: Samanya and Vishesha Shodhana of Naga was carried out. Time taken for melting of Naga, physico-chemical changes in media used for Shodhana and weight changes after Shodhana were recorded. Samples of Naga were collected after Shodhana in each media for TGA and FTIR analysis. Results: Average loss occurred during Shodhana was 6.26%. Melting point of Ashuddha Naga was 327.46°C, and it was 328.42°C after Shodhana. Percentage purity of Naga (percentage of lead in Naga) decreased after Shodhana from 99.80% to 99.40%. FTIR analysis of Shodhita Naga in each sample showed stretching vibrations particularly between C-H and C-N bonds that are indicating the presence of various organic compounds. 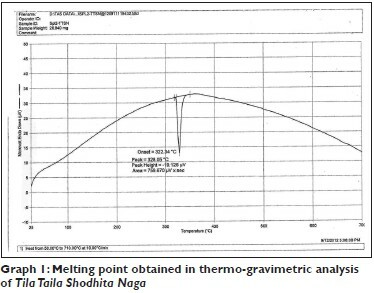 Conclusion: According to TGA and FTIR analysis, Shodhana process increases melting point of Naga and initiation of new physico-chemical properties which are indicated by detection of large number of functional groups and organo-metallic nature of Shodhita Naga. Background: Learning, the process of acquiring memory such as behavioral change due to previous experiences and most intensively studied subjects in the field of neuroscience through various approaches to understand the mechanisms. Brahmi Ghrita (BG) was claimed for the treatment of learning and memory disorders in human being. Aim: To assess learning and memory activity of BG in normal rats. Materials and Methods: For this study, 24 rats were taken and divided into four groups (six in each). First group served as the control group, second and the third group as BG treated groups (400 and 800 mg/kg, p. o.) and the fourth group as standard drug (piracetam) 500 mg/kg, p.o. treated group. Learning and memory, activity of BG was evaluated in normal rats, using elevated maze plus and passive avoidance test. Results: BG and piracetam treated rats demonstrated a significant decrease in transfer latency in modified elevated plus maze test and increase in step through latency in passive avoidance test compared with control rats in a dose dependent manner. It may be due to increase in learning and memory. It was also reported that prolonged use of Bacopa monneri (L.) Pennell causes elevation of cerebral glutamic acid and transient increase in gamma aminobutaric acid, which may be helpful in the process of learning. Conclusion: Brahmi Ghrita enhances learning and memory as analogous to standard drug (piracetam) in normal rats. Background: Withania somnifera is an important medicinal plant that has been used in Ayurvedic and indigenous medicine since ancient times. In the view of its varied therapeutic potential, it has also been the subject of considerable modern scientific attention. Attention has been drawn to antibacterial activity of the plant and its metabolites due to the challenge on growing antibacterial resistant pathogens. Aim: To examine the antimicrobial potential of leaf extract of W. somnifera against Gram-positive cocci. 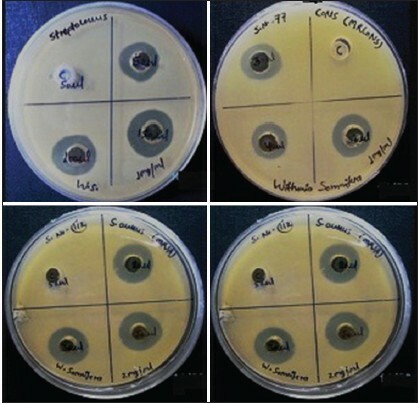 Materials and Methods: In this study, leaf extract of W. somnifera was used to examine their antimicrobial potential against Gram-positive cocci (n = 20) from pus samples of patients admitted in Government Medical College, Haldwani. Agar well diffusion method was used by taking methanolic leaf extract of W. somnifera. Results: It was observed that the methanolic leaf extract of W. somnifera was very effective in inhibiting the test pathogens including methicillin resistant Staphylococcus aureus and Enterococcus spp., with an average zone of inhibition of 20.6 mm and 19.4 mm at 2 mg/ml (100 μl) concentration, respectively. Conclusion: These results indicate that the antimicrobial property of W. somnifera leaf supports the traditional use of the plant in therapeutic use against microbial infections. Background: Herbal products from Ayurveda were always in the forefront in providing leads to new drug discovery. Triphala, an ancient Ayurvedic herbal formulation comprises of equal portions of Amalaki, Bibhitaki and Haritaki and is used extensively for constipation, as an anti-inflammatory, analgesic, anti-arthritic, hypoglycemic and an anti-aging agent. Aim: To evaluate the effect of Triphala on dextran sulphate sodium induced colitis in rats. Materials and Methods: Present study carried out in total five groups (n = 6 in each group); first group served as normal, second group control, third group standard control and remaining two as test drug groups. Mesalzine was used as a standard drug for comparison. Two doses (150 mg/kg and 300 mg/kg) of Triphala were given as treatment for two separate groups of colitis rats for 7 days. 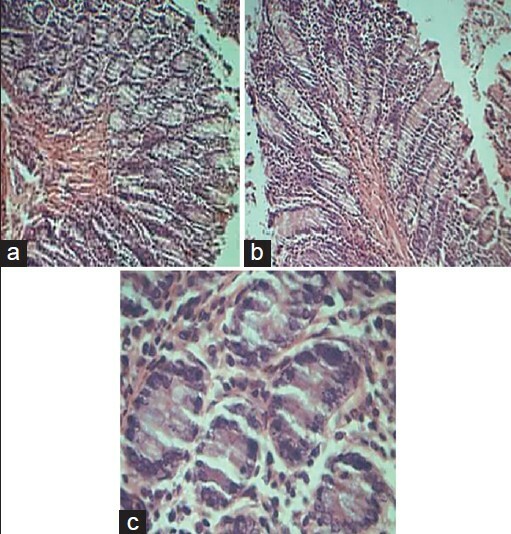 C-reactive protein, superoxide dismutase, catalase, malondialdehyde levels were evaluated and histological study of the distal colon was conducted. Results: The colitis rats treated with higher dose of Triphala (300 mg/kg) exhibited normal parameters similar to normal control group animals, which is on par with standard drug mesalzine effect. Conclusion: The results suggest that Triphala (300 mg/kg) has a considerable and reliable effect in reducing colitis in rats. This effect can be attributed to its antioxidant activity and well presence of flavonoids. Background: Ethno-medical claims indicate that leaf of Holoptelea integrifolia (Roxb.) Planch is being used in pain, inflammatory conditions by the Koya tribes. Aim: To evaluate and compare the anti-inflammatory and analgesic activity of leaves of H. integrifolia in powder and decoction forms . Materials and Methods: The leaves of H. integrifolia were made into powder and decoction form using guidelines mentioned in Ayurvedic Pharmacopeia of India. The anti-inflammatory activity of test drug was evaluated against carrageenan and formalin induced paw edema and analgesic activity with formalin induced paw licking and tail flick response using Wistar albino rats. Results: Administration of leaf powder showed insignificant inhibition of carrageenan induced paw edema at 1 h (21.62%) compared to the control group. Administration of decoction of leaves showed insignificant inhibition of carrageenan induced paw edema at 1 h (18.12%) and 3 h (9.78%). 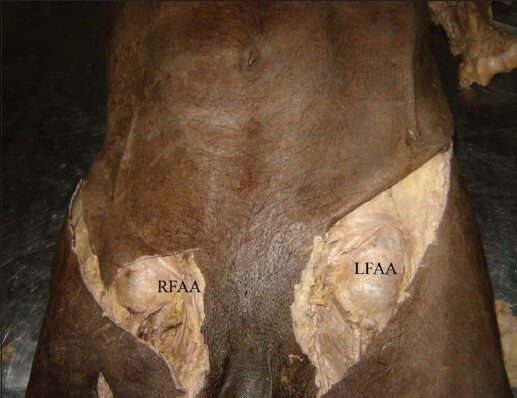 Administration of leaf powder decreased the paw edema at 24 h (37.65%) and 48 h (66.30%) while treatment with leaf decoction showed apparent decrease in paw edema at 24 h (13.68%) and 48 h (52.42%) but failed to reach at significant level of formalin induced paw edema in rats. The test drugs did not produce any effect on radiant heat induced pain in rats and formalin induced paw licking response. Conclusion: Leaf decoction of H. integrifolia has better anti-inflammatory activity than leaf powder while they have not shown significant analgesic effects in both the experimental models. Background: Bilva Moola (root of Aegle marmelos Corr.) is one of the ingredients of Dashamoola. According to Siddha Bhaishaja Manimala, therapeutical properties denoted for the official part used are to be considered for all the other parts of the same plant. If the leaf of the plant is equally effective as the root then the destruction of the whole plant can be prevented. Aim: Study is planned to assess whether the leaves of Bilva can be substituted for its root by using the parameter of diuretic activity in experimental animals. Materials and Methods: Both samples Bilva Moola and Patra were administered to experimental rats by oral route at dose of 450 mg/kg. Control group received only normal saline. The diuretic effect was evaluated by measuring urine volume, sodium, potassium content in urine. Glucose, bilirubin, ketone, specific gravity, blood, pH of urine, protein, and urobilinogen, were also measured. Results: Both test drugs showed increase in urine output but root sample showed maximum output compared to leaves treated and control group of rats. Sodium and potassium level is found more pronounced in root than the leaf. There is a mild increase in urine pH for both the drugs. There is absence of glucose, bilirubin, ketone and haemoglobin in all the groups. Conclusion: The root sample of the plant showed a greater effect as diuretic in comparison to leaf, hence as per the concept leaves may replace root in Dashamoola and can be used as Shothahara but effect may be less compared to root part.